I just had a lovely weekend away with the NZAC crew. On Saturday afternoon we walked into Pinnicals hut which took about three and a half hours in heavy snow. It was quite cold, but the group worked extremely well together to make a fire, collect water and get the tea on. The group were Helena and Andy, John and Robyn and Josh plus myself. 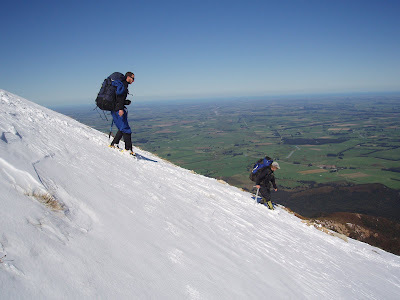 Today we ascended Mt Somers from the saddle above pinnicals. Conditions were perfect all day with excellent views all the way to Mt Cook. The Ryolite rock was inviting and we were soon doing a bit of rock scrambling. Especially Josh and Helena who were both rock climbers. We then ascended to the summit and had some lunch on the top. Coming down we couldn't resist a bit of ice climbing in a shady gully, just to test out some gear and to develop skills and confidence. This was followed by a longish walk out to the carpark. I really enjoyed the trip and hope to take part in many more! 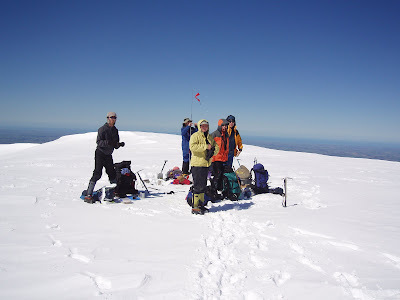 The photos are on the summit(there was still almost 2m of snow) and descending the ridge. I actually thought about that pretty hard, but with the bush walk in and the icy slabs on the SE section I'm glad I didn't take them. Plus I ended up leading the trip so it was a chance to use the Alpine skill set once again. Woolshed creek hut would be awesome! for touring from. good to see you getting out there. A little worried myself about the lack of skis on some of your recent trips! How is the Otira valley looking?